If you live in an area that has dry weather for the better part of the year, or in other words – most of Australia, having a garden hose is more than just a convenience; it’s a necessity for keeping your outdoor space alive. It helps keep your lawn green and healthy, your flower beds blooming, your car looking spotless, and your kids happy. Simply put, a garden hose is an excellent tool to ensure your property is always in a great condition. If you’re like most Australians, you probably have this green plastic irrigation tool lying around in your yard. Let’s admit it, we’re all guilty of discarding our hoses after we’ve used them. I mean, who has the time to properly store it away in a garage or shed? If you’re sick and tired from having to untangle your hose for the hundredth time and having to drag it around your property, it’s time you got a garden hose reel. Although it’s a rather simple tool, the benefits of using a garden hose reel are plenty. It winds the hose up smoothly, keeping it properly tucked away without being tangled. This means your lawn will look tidy and there won’t be any potential risk of you or your kids tripping. The reel can also prolong your hose’s lifespan, because when it’s being left lying around it’s prone to damage – like for instance, your pets chewing on it, or people stepping on it. What’s more, it makes the hose more portable, allowing you to take it anywhere you need it. The soaker hose that’s left hidden inside a flower bed, or a short flexible hose, might not need a hose reel, however, it can still be utilised for greater convenience. Generally, garden hose reels come in two different types – hanging and detached reels. A hanging hose reel is a convenient space-saving tool, as it can be attached to the exterior of the house. The most basic type of hanging reel is made of plastic and has a handle on the end that you can turn to wind the hose up over the wheel. There are also more advanced versions which are completely enclosed so that the hose is protected from the damaging effects of the elements. On the other hand, detached hose reels are designed to be placed on the ground and are enclosed to hide the hose. They generally come in unobtrusive designs and in a green colour to be able to blend in the décor. 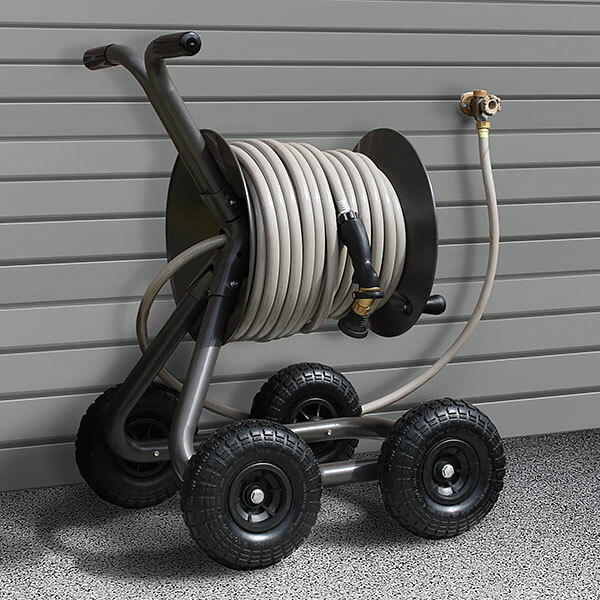 Advanced models include features that make them easy to move around, like for instance, carts with wheels and handles so that you can easily drag the hose around the yard as you work. Consider how and where you’ll be using yours so that you can choose a proper garden hose reel. Also, make sure that the reel is suitable for your hose’s length before buying it. Getting a larger model can be a smart decision as it enables you to wind up any hose size, be it a large or a small one.